You always felt like you knew them on a first-name basis. And that they knew you, too. 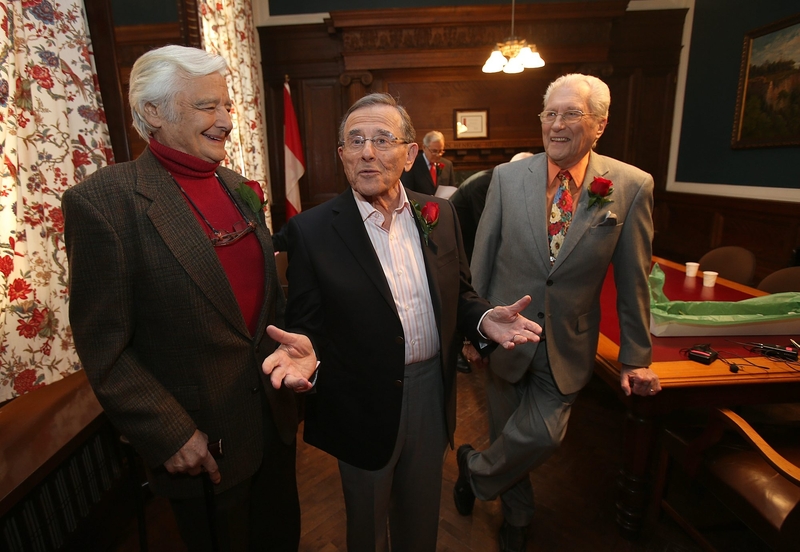 That’s why Buffalo’s most famous trio next to the French Connection – Irv Weinstein, Rick Azar and Tom Jolls – drew a standing-room-only crowd at the Buffalo History Museum Friday night for the highly anticipated reunion of the legendary Channel 7 Eyewitness News team. Weinstein, who was flanked on stage by Azar to his left and Jolls on his right, kept those in attendance in stitches all night with behind-the-scenes tales of life at Channel 7 during a tenure that spanned nearly a quarter century, ending with Azar’s retirement from the station in 1989. Weinstein retired on New Year’s Eve 1998. “They were real and there was a genuine camaraderie that came together and came through the cameras and into people’s living rooms,” said Constance Caldwell, director of communications at the museum, about the connection the trio made with viewers in Western New York and Southern Ontario. “Buffalo Blazebusters,” “Pistol Packing Punks,” “Rick with the Sports,” and “Salubrious Summer Days” are but a few of the phrases that many can recall like it was yesterday, said those at Friday’s event. WKBW’s current longtime anchor, Keith Radford, who emceed the “M&T Third Fridays Giants of Buffalo” discussion at the museum, opened the night with a – maybe more true than funny – quip about how ingrained Weinstein and the old team are in Buffalo. There was a downright giddy level of excitement during an hourlong cocktail hour that preceded the discussion in the museum’s atrium. “It’s like a rock concert,” quipped McCarville of the atmosphere. The legends traded tales all evening. They told stories of how they had bigger opportunities elsewhere, but always returned to each other in Buffalo. Accounts of Irv’s unique ride: a French-built Citroen automobile. And an insider’s secret about how Irv often tagged a neighbor’s name onto the end credits when introducing the late-night movie following the 11 o’clock Eyewitness News. The three giants of Buffalo broadcasting, who first came together in 1965 and comprised the longest running anchor team in the history of television, were last together for a 2012 telethon but say they communicate daily by email. They embrace their celebrity but seem to feel blessed by each other. Jolls, 80, served up the “Weather Outside” for 34 years and was “Commander Tom” on one of the region’s most popular children’s television programs.